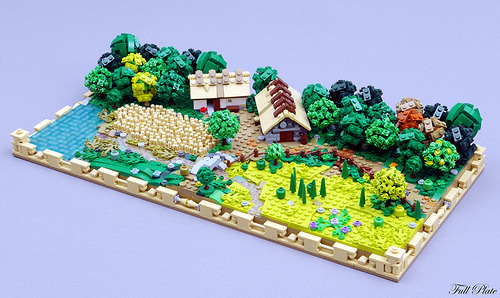 This microscale LEGO landscape by Emil Lidé offers a picturesque insight into the expansion of the LEGO colour palette — particularly in green. The model’s colour scheme effortlessly recreates a realistic forest feel, and the variety of colours is supported by the variety of construction techniques used amongst the trees. Beyond the forestry, there are some lovely touches — don’t miss the tan Technic pins used to create the wheat field, and the fence built from brown minifigure hands. The only thing I’m unconvinced by is the elaborate border on the diorama’s base — I think it distracts from the central build and would have been better as a plain construction. However, that’s a minor quibble with an otherwise excellent creation. Nice attention to detail. I might have to agree on the base. It looks almost like it’s built on some old ruins or something? Still, well done. Am I the only one who is suddenly experiencing an emo mood for minecraft?